After moving to North Carolina from West Coast USA, Alex Torres was a lonely bodysurfer. When he got the time off work and family duties his favorite pastime would find him alienated amongst many beachgoers who had never seen anyone swim onto a wave and ride it to the shore spinning and getting tubed. 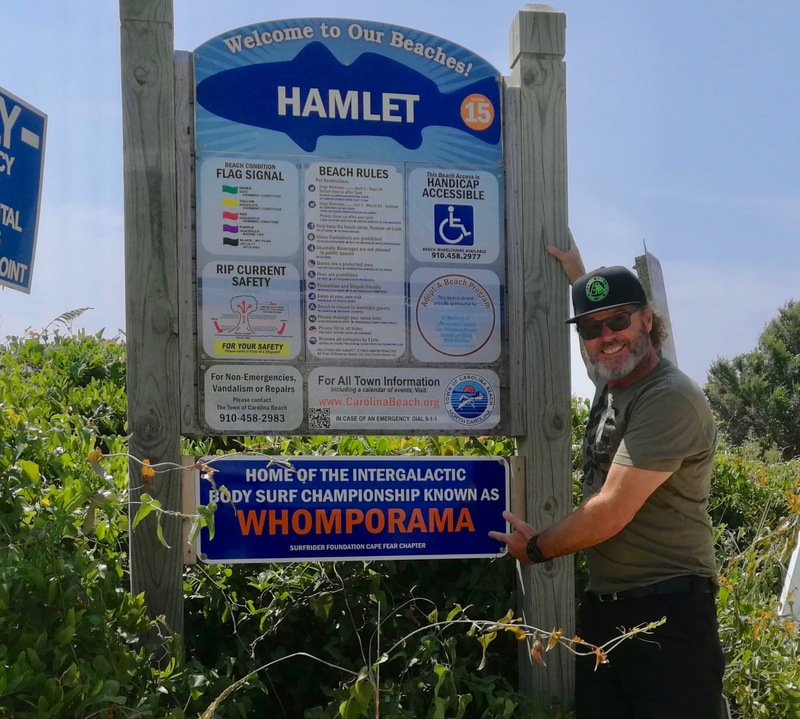 That was seven years ago and since then, The Intergalactic Bodysurf Championships- Whomparama has attracted large numbers of local bodysurfers, lifeguards, surfers, bodyboarders and many local businesses for donations and support. I was fortunate to attend this year and I witnessed every contestant and spectator having an immense amount of fun. Laughter filled the beach regardless of conditions which were not the greatest waves of all time. But that wasn’t the point. This contest is all about genuine beach fun and raising money for worthwhile causes. The pre-contest work that goes into Whomparama is all volunteer based. 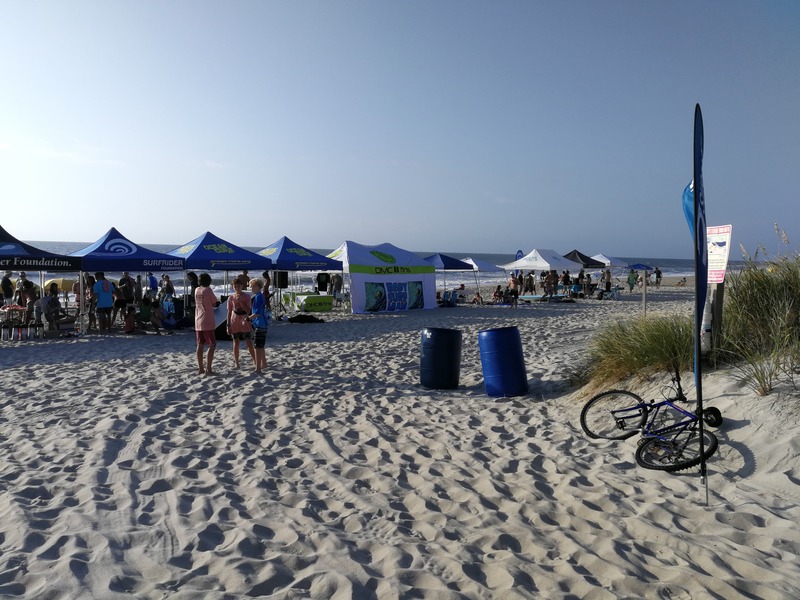 The Carolina Beach community pitches in to provide everything from tents to colored caps for the competitors and t-shirt design/printing. The trophies are made by Alex and one of his buddies, Peyton Chitty. One year the trophies were over 6 feet high. This year they were donated leftovers from an old trophy factory and sprayed in Rastafarian colors. 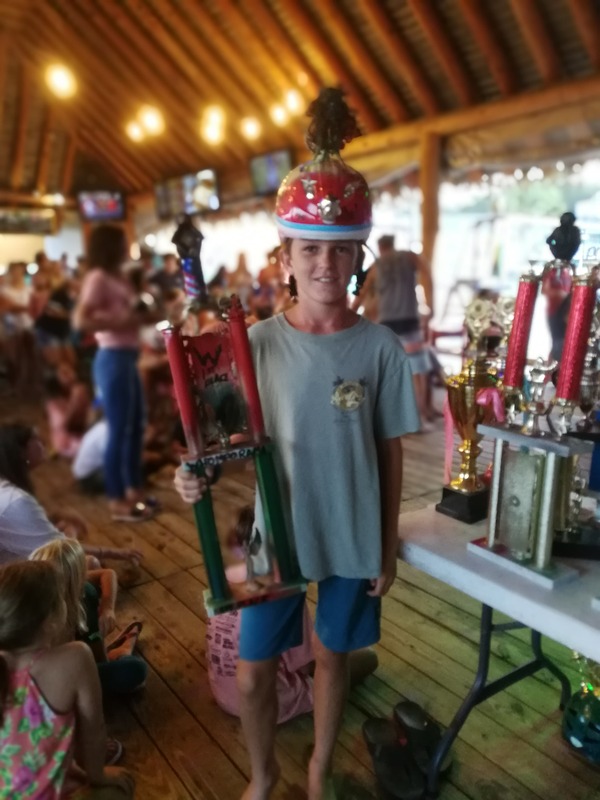 Each winner received a large trophy and along with it, a helmet with recycled trophy bits attached, spray painted and adorned with doll body parts. Alex and Peyton wax lyrically on the microphone all day with banter akin to a comedy sketch, in between some great music from an eclectic playlist. Heats are called, locals are heckled and any surfboard that enters the Whomp zone better lookout! Divisions included of kids, women’s, men’s and the SUPER KOOK EXPRESSION SESSION for the uninhibited, which fought in the best spirit of fun. The after party was held at the Lazy Pirate and nobody missed it. Music, fun, ceremony, live music and dancing. 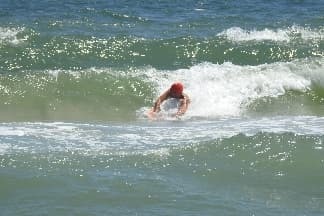 The waves remained half to one foot onshore tidally affected throughout but nobody cared. They raised $3,800 for their charities and everybody, I mean everybody, who went near the Whomparama had an absolute blast. Next Post Why? How? When?